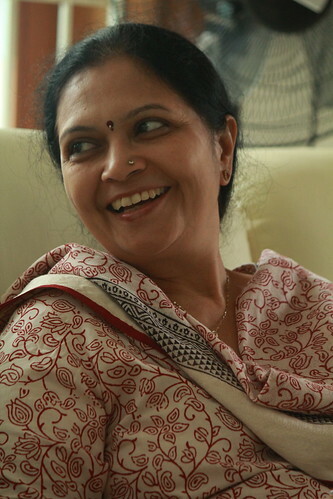 I have known her as a Reiki Healer and Ashtamangal Meditator until now. I enjoy speaking with her about topics such as aura, healing and positive vibes. What makes the conversation interesting is her curiosity and open-mindedness. She is willing to discuss and think, and re-think. One statement of hers, in particular, has embedded itself on my mind, “Whatever you see outside is possible only because it is inside you. When you see someone as angry, you see it because there is anger within you. So also, when you see someone as beautiful, you see it because there is beauty within you.” We have discussed this proposition time and again, and even though it may seem a tautology, its pragmatic effect cannot be undermined. Because it allows us to stop our blame games and self-pity, and work at becoming pro-active for our own happiness. Such is the wisdom of my friend Kirtida Shah, a healer from Chennai. 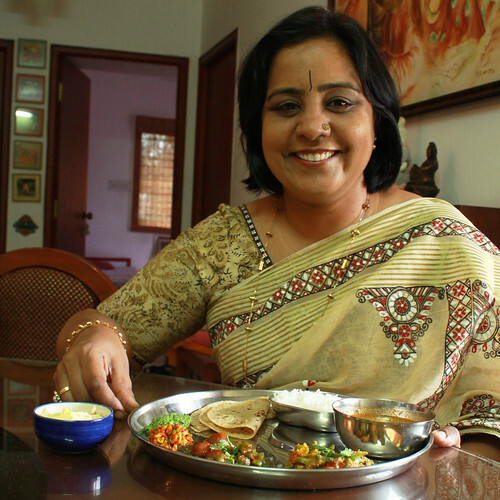 Hence when she invited me home for a Gujarati meal, I agreed and made a request, “Kirtida, I would love to come only if you promise me a simple home-cooked meal.” Knowing my penchant for regional flavours and traditional recipes, she happily agreed. The lunch, to say the least, was a treat to the palate, and the heart. For food cooked and served with love has an unparalleled position in this world! And when that food is rich in regional flavours, then all one can do is thank the universe for the meal, and EAT it. 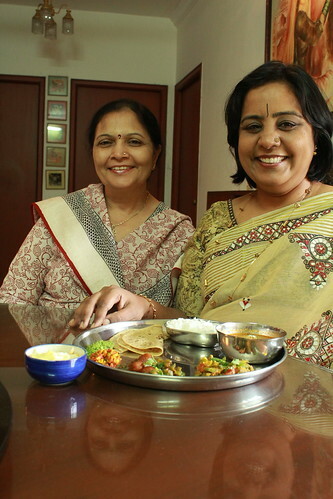 She treated me to delicacies that are popular in most Gujarati homes – Soft rotis served with Fansi muthiya nu shaak – a side-dish made with french beans and steamed dumplings of gram flour; Tindora nu shaak – a side-dish with pointed gourd; Parwal ka achaar – a fresh pickle with finely chopped pointed gourd; and Kothmiri sing ni chutney – a chutney with fresh coriander and groundnuts, which was prepared by her daughter Khyati. Also steamed rice known as Bhaat with Tuverni dal – a sweetish-spicy dal made with red gram, finally ending with Shrikhand, a sweet dish made with hung curds, sugar and nuts. I appreciate the honesty with which Kirtida asked me if I would like to taste the previous night’s Muthiya – steamed dumplings with gram flour – to which I nodded blissfully. 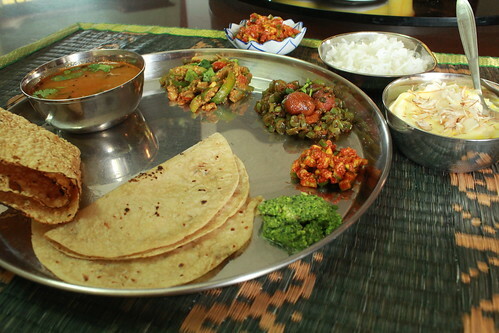 All in all, the flavours were perfect and the visual impact as powerful – an unforgettable Gujarati meal.